iTunes Seller:Seller: Infovole Infovole e.K. • Have a look at Textkraft: This app has all features unlocked (no In-App-Purchases) and it includes additional tools such as the built-in offline-dictionary with thesaurus and more custom settings. This user-friendly and simple text editor is the ultimative productivity text tool for your iPad®. • Quick selection-marker for word, sentence and paragraph with much less finger-movement hassle. • The magic éüç-button for all diacritical marks, accents and "Umlauts". • The Spell-Aid-button finds all unknown and wrong words. • Cursor keys better than on a real keyboard. 8 keys with 10 functions. • Switch from upper to lower case with one tap. • All missing special characters and symbols directly accessible. • Undo/Redo and history function to test various phrasings. • Full support of all onscreen and bluetooth keyboards. • Wikipedia full-text search and online dictionary - all languages supported. • Reading mode prevents accidental keyboard entries. • Import & export with iTunes® file sharing. • Opening Microsoft® Word®-documents (DOCX/DOC) with the app "Word-2-Text". • Sharing text as iMessage or via Twitter. 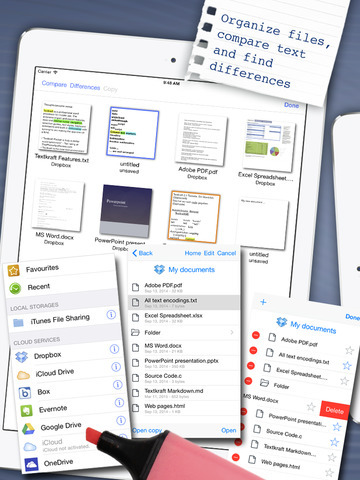 • Direct communication with Pages®, Evernote® and other apps. • Supports iOS 4.3, 5.x, 6.x and newer. • Sharing text via e-mail: Send your text via e-mail or as text file attachment. • iCloud & Dropbox: Open and save text with iCloud and Dropbox. • Extensive font-style menu: Change the font size and line spacing; 6 color themes and 10 font faces to choose from. • Search: Built-in full-text search with SASR™: Search and Smart Replace - Case sensitivity retains when you replace a word. • PDF export: Attach PDF to an e-mail and save PDF files. • Printing with WYSIWYG preview: Prints texts directly with AirPrint™. The WYSIWYG preview (with iOS 5 or newer) lets you customize font size, number of pages and other options before printing. • Text Information Display: Wide ranged text information, such as page and word count, file size, modification time, as well as cursor position. The user interface is available in English, German, French, Spanish, Dutch and Italian. 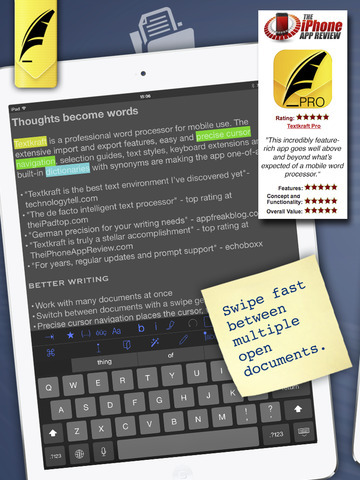 • GREAT OFFER: Word-2-Text for iPad & iPhone. Opens Word-documents in Wortkraft Lite and any other app. Get it now! • Unfortunately it is not possible to respond to your comments when you put them in an App Store rating. But we care. So please contact our support in case of problems. We'll be happy to help you promptly. Your mobile device must have at least 10.9 MB of space to download and install Easy Writer Lite app. Easy Writer Lite is FREE to download. Hurry up to get this app for free! If you have any problems with installation or in-app purchase, found bugs, questions, comments about this application, you can visit the official website of Infovole Infovole e.K. at http://www.infovole.de/en/. - Consumes up to 70% less energy! - New color theme "Green Parrot"
- Bug fixes for passcode lock, undocked keyboard, special chars and diacritics, bracket function, Microsoft OneDrive, Evernote, read aloud function and the "extended forward delete"